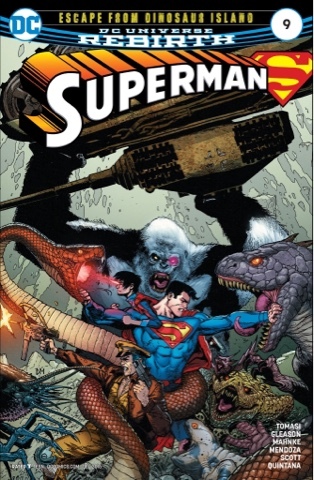 Superman, Superboy and Superdog have been teleported to Dinosaur Island by a Mother Box-alike that began life as Jon’s science project. But it’s gone missing, and after a spot of dino-punching, father, son and four-legged flying friend take a break in a cave. It’s Captain Storm, one of the Second World War gang nicknamed The Losers. 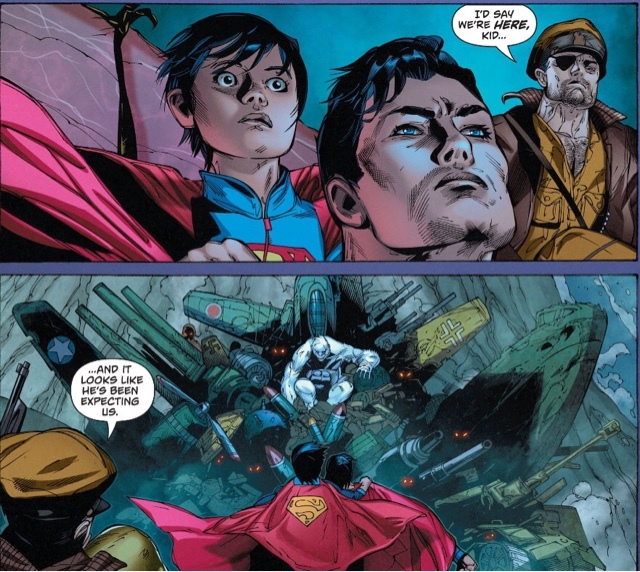 Clark and Jon found their remains last issue, along with Storm’s wooden leg, but here he is, big as life. From PT boat to pterodactyl! Along with a whole batch of terrifying critters, they come across a white gorilla who, like Cave Carson, has a Cybernetic Eye. But does he have the gadget? 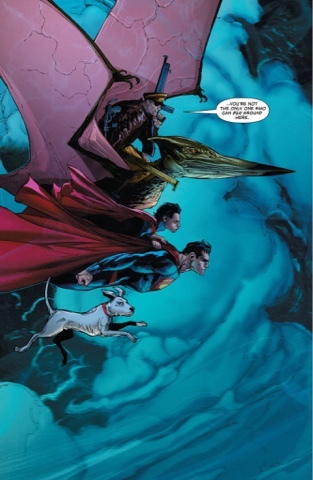 Writers Peter J Tomasi and Patrick Gleason conclude the story began last issue in final style – this is a rip-roaring, boys’ own adventure. Not that Lois Lane is forgotten. I really like this moment as Jon reminds us, along with his dad, that while he’s taken to his new life as a super-son with aplomb, he’s still just a young lad who needs his mother. 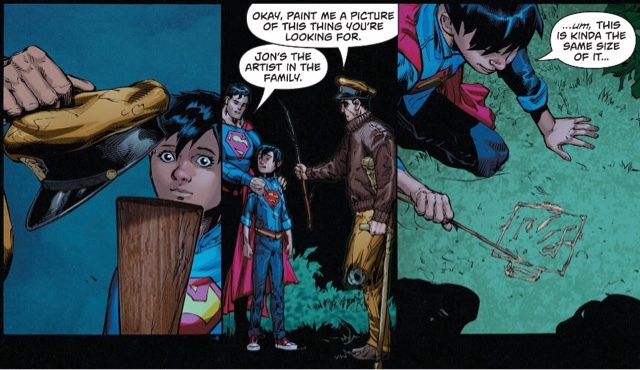 I also like that Clark is such a great dad, helping Jon deal with the frankly terrifying world they’ve found themselves in, while still trying to protect him from the worst horrors. Then there’s the unexpected wrinkle that with two writers for parents, Jon’s talents might run to art. 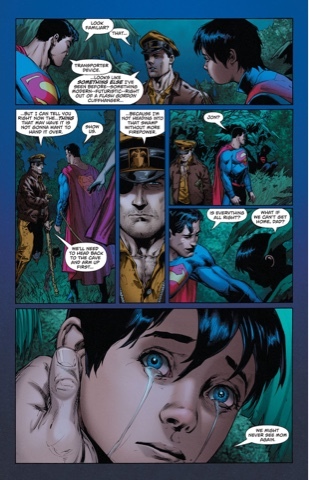 And how great is that first panel, with Jon full of wonder at the bravery and comradeship of men at war? It’s good to see Captain Storm survived his arrival on Dinosaur Island, a sadder man but with his fighting spirit intact. The place seems to be in a temporal amber, with him not ageing and unable to recall how long he’s been there. And a massive white gorilla? Is it the Ultra-Humanite? Penciler Doug Mahnke, inkers Jaime Mendoza and Trevor Scott, and colourist Wil Quintana should win an award for their work here – it’s kinetic, frenetic, full of detail, coloured with vigour and an all-round joy to behold. The layouts are dynamite, bursting with energy, while the protagonists have personality to spare. As for the dinosaurs and other assorted beasties, yipes! Rob Leigh, meanwhile, brings out the drama of the dialogue with his smart lettering. Then there’s the regular cover by Mahnke, Mendoza and Quntana, a nicely balanced action scene, and the variant by Andrew Robinson, with a cutely hilarious Jon. DC really are spoiling us. This issue sets up mysteries for the future while delivering a satisfying yarn, another superb chapter in the neverending battle. Unadulterated pleasure. 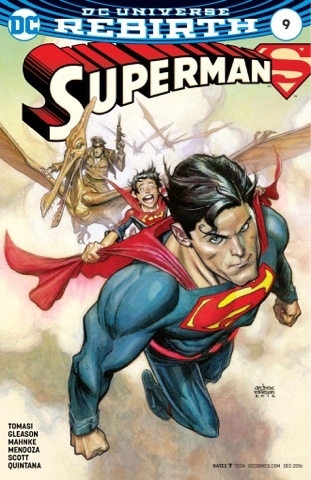 The Superman books have been so good lately. 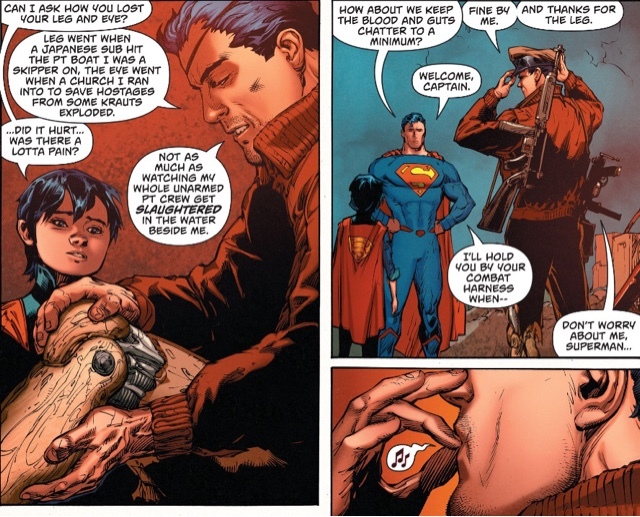 Clark is such a good dad, and any worries I had about the addition of Jon to the mythos have dissipated. He's wonderful. And nice wordplay with the PT boat to pterodactyl! Cheers, some lines just write themselves! I wonder if we're getting an annual. I would love an annual! We're in luck: Superman and Batman Annuals come out in late November! That would be wonderfully Golden Age throwbacks! Thanks for the comment! Fear not, The solicits were read!